This 2 bedroom, 2 bathroom old Florida home boasts a fabulous location in the historic river district of Bonita Springs. Conveniently situated just a few blocks from the Imperial River, steps to the Bonita Springs Public Library, area Schools, the Bonita Springs Community Park and only minutes to Barefoot Beach! Also, the Downtown Bonita Springs area is slated for redevelopment with substantial support from the city. In addition to the great location, the home features cathedral ceilings, an open floor plan, 7″ baseboards and laminate flooring. The AC unit is new and the master bedroom offers a nice, large walk-in closet. Call today to tour! This charming 3 bedroom cottage home sits centrally located and just one block from the Caloosahatchee River! Quality upgrades radiate throughout this home. White cabinets, new floors and a 2-year old metal roof make this old charm feel new. The private backyard is lovely and boasts mature trees and a great patio space. Call today to schedule your showing. The smart home of the future! This absolutely stunning 4 bedroom + den pool home is nestled on a peaceful mahogany tree-lined cul-de-sac in the charming, gated and highly desirable McGregor Reserve neighborhood. With over 3,300 square feet of living space, this estate home offers plenty of room and an abundance of storage space. The entry way is picture perfect, boasting a grand decorative staircase, new custom French doors and architectural picture window accents. The custom kitchen showcases custom cabinetry, Samsung smart refrigerator, Jenn-Air double ovens, induction cooktop, wine chiller, etc. The home also features plantation shutters, a den with built-ins, 4 bathrooms, a separate custom wine bar, whole home surround sound, new pool cage with a picture window and a 1st floor master bedroom with an attached 5-star resort bath. A full camera security system, smart locks/thermostats and completely custom built-out separate garages 2 car + 1 car both with AC are additional popular upgrades. McGregor Reserve amenities include a clubhouse, community pool, lake fountains, mature landscaping and lantern lit streets and sidewalks…true Old Florida living at its best. Call today. This inviting 3 bedroom, 2 bath home is located in the heart of Bonita Springs. The open-concept floor plan offers laminate wood floors and plenty of living space with a large living room, easy access kitchen and dining area. This home also boasts lovely architectural detail including arched doorways and vaulted ceilings. The split bedrooms are spacious and feature carpet in them. There is an additional storage area in the over sized 2-car garage, the AC unit is newer and the home comes equipped with hurricane shutters. Ideally situated on a corner lot with a fenced in backyard and patio. Close to area beaches, shopping/dining and within walking distance to Riverside Park in downtown Bonita Springs! A picture is worth a 1000 words and it could not be more true when it comes to this beautiful home. Let’s start with the beautifully upgraded kitchen. Shaker cabinetry in a rich coffee tone topped with dazzling quartz counter tops and finished off with glass subway tiles and LED lighting. The custom lighting alone makes this fabulous home stand out from the crowd. Check out the stunning dining room chandelier. This charming 3 bedroom home is perfectly situated in the heart of Estero! Literally! just minutes to Miromar Outlets, Gulf Coast Town Center, Coconut Point, I-75, Southwest Florida International Airport, Schools and More! In addition to the prime location, this single family home boasts a private screened-in lanai with a lovely view of the freshwater lake, vaulted and tray ceilings and a 2-car garage. Amenities within Lakes of Estero include a clubhouse, fitness center, community pool, tennis and basketball courts. HOA fees include lawn maintenance, irrigation maintenance, and Cable, taking all the work and expense out of owning a home. Call today to tour this must see home! 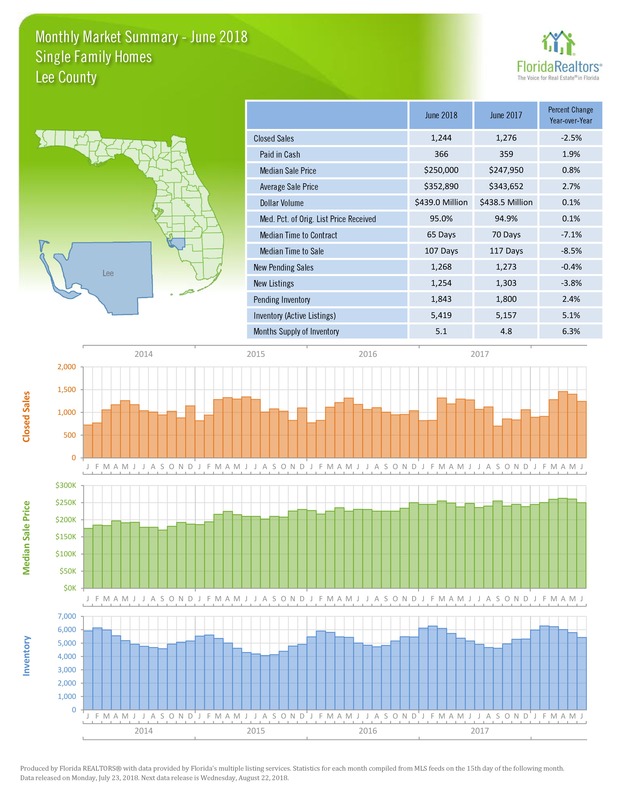 (Fort Myers, FL – July 23, 2018) – The Lee County housing market slowed down slightly in June, according to the latest data released by Florida Realtors®. However, that dip is typical for the beginning of the summer months in Southwest Florida. Overall there were 1,244 Closed Sales of Single Family Homes in June 2018, compared to 1,276, while May 2018 had 1,400 closed sales, which is a difference of 156 total closings. However, compared to June 2017, the total number of closed sales only dropped 2.5% year-over-year. Other changes were minimal both for Single Family Homes and Townhouses and Condos last month. Median Sale Price for Condos was up 7.3%, while the inventory dropped 6.5%. The number of active Single Family listings was up 5.1% and the inventory was up 6.3%. The biggest year-over-year changes come from city breakdowns as well as price points. 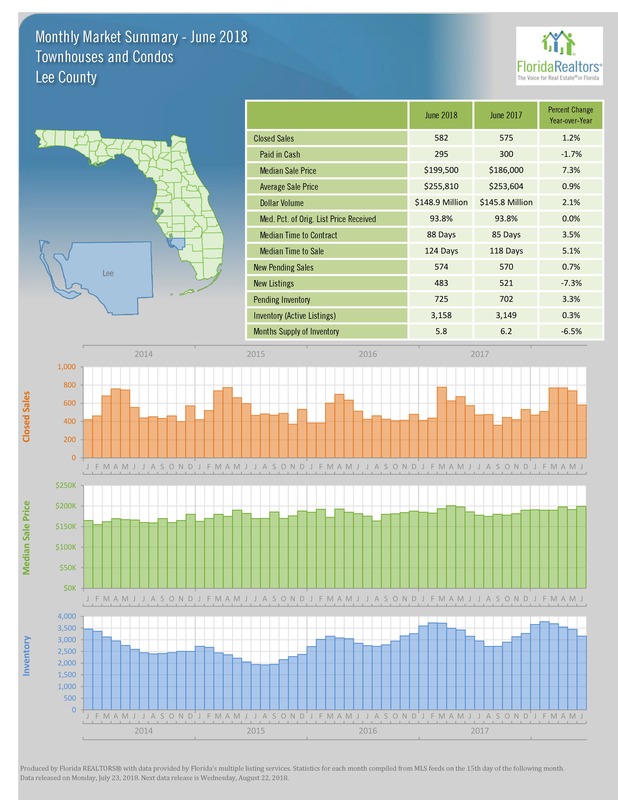 The largest drop was in Estero, where there were 25 fewer closed sales on Single Family Homes last month – a drop of 33.3%. Fort Myers Beach had the biggest jump at 18.2%. Single Family properties listed in the $50,000-$99,999 and then $100,000-$149,999 ranges both saw major drops in closed sales, at -34.6% and -35.5% respectively. The biggest increase came in the $250,000-$299,999 range with a 15.9% jump. Condos in that same range skyrocketed with a 44% increase in Closed Sales last month. The biggest drop for Condos came in the Less than $50,000 category, with only 3 closed sales (or a drop of 50%). 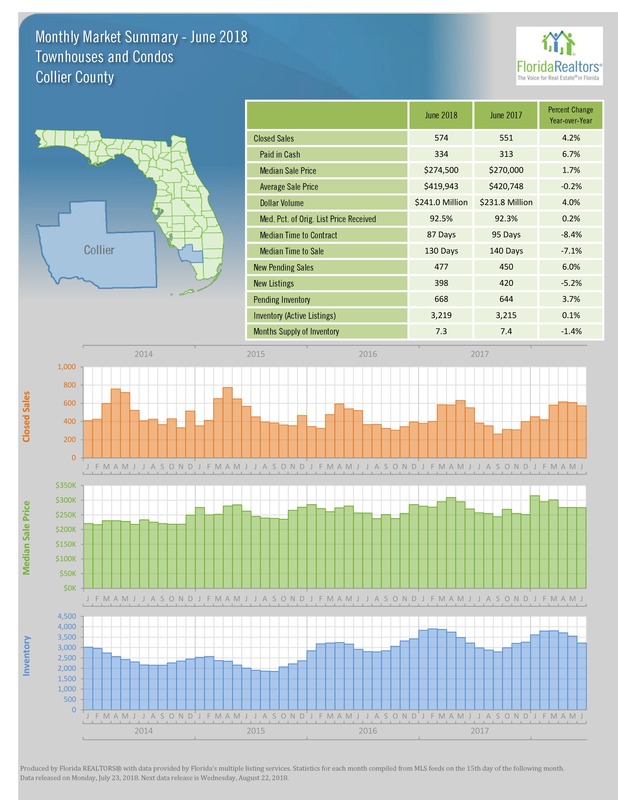 Naples, Fla. (July 13, 2018) – Activity in the Naples area housing market during the Second Quarter of 2018 remained steady in comparison to activity during the Second Quarter of 2017. According to the 2Q 2018 Market Report released by the Naples Area Board of REALTORS® (NABOR®), which tracks home listings and sales within Collier County (excluding Marco Island), overall closed sales increased 2 percent to 2,926 properties in the 2Q of 2018 from 2,880 in the 2Q of 2017. But in the $2 million and above single-family home market, closed sales rose 25 percent in the 2Q of 2018, which—along with other market indicators—leads many broker analysts to believe that interest in luxury homes will remain in high demand. Brad and His Team of Experienced Realtors Made My Entire Selling Process Extremely Easy! This 2 bedroom + den pool home is located in the gated, Glen Eagle Golf and Country Club just 5 miles from area beaches and coveted downtown Naples. Surrounded by lush, tropical landscaping the exterior boasts an ultra private pool and lanai with a large screen cage. Inside, this lovely home features vaulted ceilings, tile flooring and custom mirrors. Glen Eagle Golf & Country Club is an amenity laden development and boasts a newly renovated 70-par golf course designed by Gordon Lewis, clubhouse with restaurant, fitness center, community pool, lighted Har-Tru tennis courts, bocce courts, billiards room, card room and more. GOLF MEMBERSHIP INCLUDED. Call today to tour this magnificent home and community. Take a look at this beautiful 4 bedroom home that is situated on over an acre of land strategically placed between Immokalee Rd to the North and Golden Gate to the South. Escape the onerous HOA dues that are so prevalent in Southwest Florida and spread out a little. Pull right in to your 3 car garage then step into this meticulously kept home. You will find it to be light and bright and featuring tile throughout all living areas with carpet in the bedrooms. The master bath features a custom double bowl vanity and a large soaking tub for your relaxation at the end of the day. The home has been recently painted inside and has received a new AC and state of the art water filtration system in the past two years. The kitchen features wood cabinetry and hard surface counter tops. Make your appointment now to see this fabulous home. “Brad is absolutely incredible. My fiance and I were first time home buyers and very nervous about the process. Brad was extremely transparent and patient from start to finish. He was able to connect us with an inspector and financing options as well — we never felt that we had to choose from his preferred list but trusted him so much that we did not want to look elsewhere. There Wasn’t A Question About Using Brad for the 2nd Time! “When we were looking to sell our house, there wasn’t a question about using Brad for the second time. 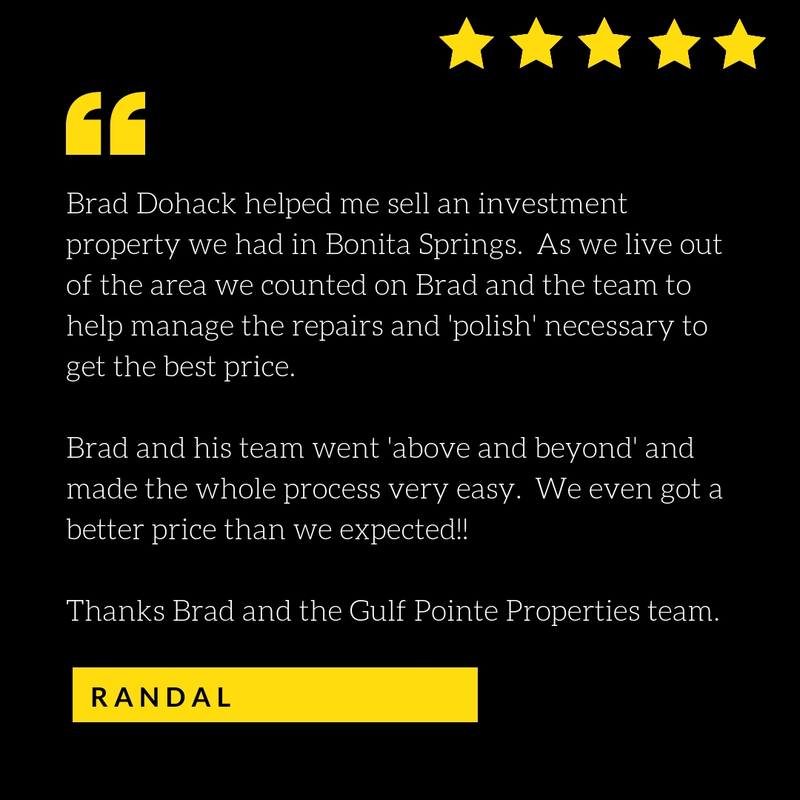 “We contacted Brad with some questions on purchasing property in South West Florida as a referral and Brad and his team did not disappoint! He is very knowledgeable and he worked with us and our budget to find the perfect property. Being from Ontario Canada we were very uncertain on the process and documents required, but Brad and his team walked us through every step and surpassed our expectations.